In this latest "Stuff I Read On The Internet" entry, I look at two complementary posts on supply and demand issues in the bond market. In "Who's Afraid Of China? ", Paul Krugman discusses the fears associated with China's massive Treasury bond holdings, and shows why they are not a worry. See the discussion on Mike Norman Economics with regards to how his taking the view of the dominance of rate expectations is a move closer to the MMT theoretical position (and mine). In "The Looming Bond Fund Crash", Paul Amery discusses the vulnerabilities noted by Citi Credit Strategist Matt King that are allegedly created by the shrinking dealer inventories of corporate bonds. The win-win solution is obvious: the Chinese government should become a market maker in corporate bonds. They can easily ramp up their corporates inventory, and they can diversify their USD exposure away from Treasurys. I agree with Paul Krugman's analysis. We could imagine a scenario where the Chinese leadership started reading some other blogs and decided that they could become the dominant geopolitical power by dumping their Treasury holdings in one day. What would happen? Obviously, they would be selling at a big discount, and the only way the market would clear is if the Fed stepped in and bought what they sold. What would be the result once all the trades clear? The Treasury holdings would just move from Chinese accounts to the Fed, and the Chinese will have lost a lot of money. They additionally would have a lot of USD deposits that they have to do something with. Once the dust settles, the Chinese would be poorer, and Treasury yields might ultimately end up lower, since securities were moved to entity that does not have to sell. The Chinese could drive down the value of the U.S. dollar, but that is incoherent with their previous currency interventions, which were driving USD higher. As a result, I do not see how this particular scenario fits China's geopolitical interests. Turning to the Paul Amery piece, the key observation is that dealer inventories are shrinking, while ETF and mutual fund holdings are rising. The worry is that dealer inventory will be too small to absorb flows from retail investors, who assume that they have ready liquidity in their ETF holdings. I assume that lower inventory levels have widened bid-offer spreads. The dealers have profit targets to meet, and so they need to make up lost carry income with more income off transactions. This matters if you are actively trading corporate securities. However, the inventory situation may make make a potential crash less dangerous. The corporate bond market typically seizes up when there is something fundamentally wrong, such as some big defaults. Investor reallocations may cause problems, but the result is usually just a temporary blip in pricing. During the latest financial crisis, corporate spreads blew out but the sell side was not very active in bidding on corporate bonds. Why? One reason is that they were stuck with too much inventory themselves going into the smash-up (as shown in the chart above). The best way to prevent a crisis is to have buying capacity sitting on the sidelines. 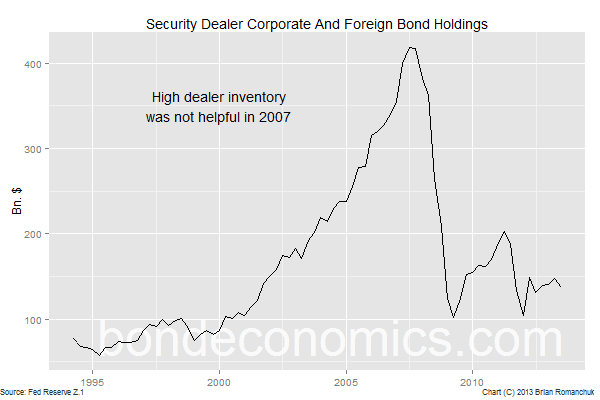 We cannot conclude from the observed dealer inventory numbers that risk capacity has been taken away permanently; it may be that the sell side has learned something from past experience and lightened up positions in response to tighter spreads.